Nessun Dorma. Photo by Michael Horne. At the time the Riverwest neighborhood was in the midst of an adjustment to the post-industrial economy as the many factories and workshops that provided employment for generations went out of business or moved away, as did many of the original residents. So the introduction of a beer named after the neighborhood itself must be seen as a milestone in retrospect. Thirty years later, Riverwest the neighborhood and Riverwest the beer are both doing fine. So is Lakefront Brewery. Today, with 67 full time and 60 part time employees, it has taken its place as a significant employer in the Riverwest neighborhood, from which the majority of its workers are drawn, and where a good number of its loyal customers live and drink in places like Nessun Dorma. Jim and Russ Klisch at the Gordon Park Pub. Photo courtesy of Lakefront Brewery. In 1987 the Gordon Park Pub, which we now know as Nessun Dorma, was typical of many others in the area in that it had been around for some time, and was showing its age. The front of the building had been much meddled with; the original windows had been cut down to a fraction of their original size, and the remainder boarded up. An ugly enclosure surrounded the front door. Microbrews had heretofore been unknown within its precincts. Today’s hipsters were yet unborn. The idea that craft beers would one day become a phenomenon and that this building would one day become a classy joint seemed the stuff of fantasy. In a 1974 memo, J. Wronski, who worked for the assessor’s office, had this to say about the place, then known as Steve and Pat’s Tap: “Ext. is fair-good. Some of the brk on sides needs repointing — Front is unattractive interior is only fair — lacks finish and is not attractive.” The floor of the tavern was asphalt tile over maple. The bar, then as now, runs 24 feet from the front window easterly along the north wall. The bar, of fine mahogany, and apparently of one-piece construction, is two feet wide. The entry door, a generous 40 inches wide, was and is located at the center of the west wall. The main bar room offers a 28-foot-by-15-foot space in addition to the bar. There was a 14-foot-by-13-foot room on the northwest corner of the space. The remainder of the first floor at that time was an apartment; today it is a kitchen and dining space, and has been so since it became Nessun Dorma, which opened as a restaurant in 2002. 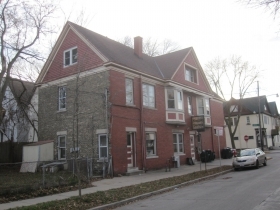 But for its first 93 years, this building was a Milwaukee corner tavern in a working class neighborhood. This handsome brick structure first enters the public record on October 1st, 1909, when “Application for Permit to Build Brick and Stone No. 1554” was issued to Mrs. Josephine “Cyzaplowski” (Czaplewski) for the construction of “1 Store 3 Flats” on a 26-foot-by-66-foot lot at the “S.E. Cor. Hadley & Weil.” The substantial 58,344-cubic foot building cost $5,800, with mason August Grosjean in charge of laying the 17-inch brick foundation and the 13-inch walls of the upper two stories. Grosjean was a prominent contractor, and was paid $17,890 to build the nearby 21st District Primary School No. 2 at Fratney and Concordia streets in 1902. He also built a house for “Mrs. Schmidt” at 18th and Center streets earlier in 1909, at a cost of $6,000. Back in the pre-Prohibition era, little distinction was made between commercial spaces, no matter what their use: they were called “stores,” even if they were saloons, which judging from the layout and other indications, this place has been for a long time. During Prohibition this place was operated by Amelia Rutkowski as a licensed “Soft Drink Parlor,” authorizing her and her husband Frank to dispense beer with no more than .05 percent alcohol. Their exact technique for getting around this alcoholic encumbrance is unknown, but it is safe to say that even during Prohibition, .05 percent alcohol beer was no more popular among the heavy drinkers of Beer City than it is today. It appears the Rutkowskis withdrew shortly thereafter from active management of the tavern, while still living in the building, which they owned and rented out to operators. 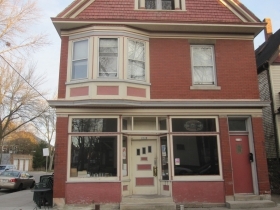 In 1935, Frank and Amelia lived in the back apartment, while Michael Machas ran the tavern. By 1940 John A. Atkielski ran the tavern. 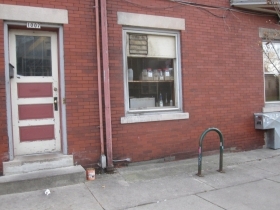 In 1942 Frank “Restowski” (Rutkowski) took out a permit to alter the front of the tavern, but it was cancelled when it expired after no work had commenced. (This happens a lot with Mom-and-Pop tavern operations, especially when Mom expects Pop to do the labor. Guess again.) In 1945, Arthur Scholz ran the tavern, the unaltered front notwithstanding. By 1950, the place was known as “Gust and Art’s Tavern,” with Gustave Scholz now being the lead partner. Since the only fuel that generally required its own room was coal, it is safe to say that the building’s mechanicals needed an upgrade. This came in 1956 when a gas conversion burner was installed, which must have pleased Frank Guzinski, who ran the tavern and presumably no longer needed to go downstairs to stoke the coal fires in the breeched and enclosed boiler room. By the beginning of the Kennedy administration, the building was owned as an investment by Mrs. Clara Westphal of 1410 E. Euclid St., a neighborhood in Bay View that might as well have been a continent away in those days, and which then and now was hardly a prominent outpost of the Rentier Class. 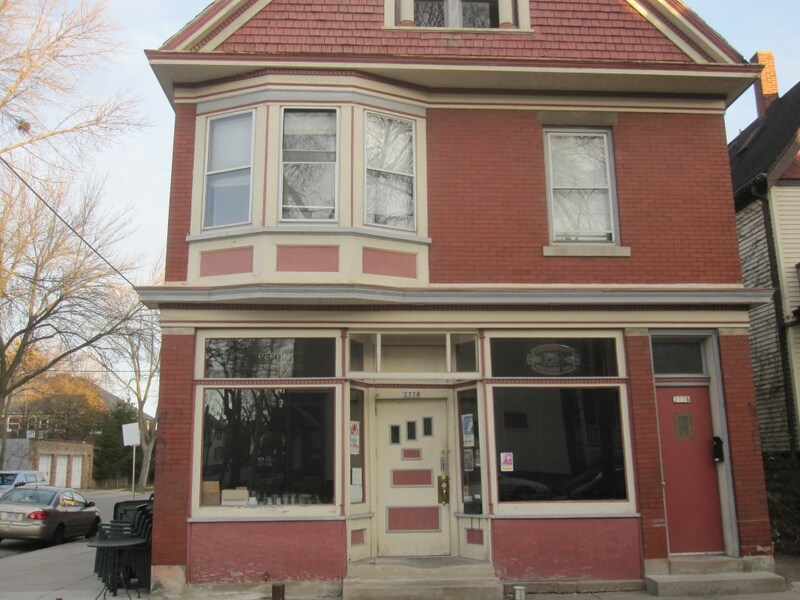 She leased the tavern to Daniel Rzentkowski and his wife Florence, who gave the place the name “Dan & Flo’s Family Tap,” which is a classic for the era and for the neighborhood. Back then every tavern was a family tavern, usually located close enough to a church so that you didn’t have to walk too far to get there after Mass. Dan and Flo operated until about 1969, and then the tavern was vacant. That year Joe Galarza wanted to open “The Rainbow Room” as a tavern/restaurant, but the building’s time for such a use was not yet to come, and that was the end of Galarza’s rainbow. In 1970 we find it listed as “Steve and Pat’s Tap Tavern,” with Steve Bichanich as the operator, with many more to come. In January, 1971 Leonard Fortino hoped to open the place, but his license went nowhere. In March of 1971, Emil Krug is listed as the operator, but by Thanksgiving that year we find Thomas J. Kent in charge. By that time the place was in a relative shambles, with many mechanical improvisations, like the extensive use of forbidden flexible cordage for electrical wiring in various fixtures throughout the building. Grit and grime was followed by paint, and then more grit and grime. Good neighborhood Tavern Business plus income. Humboldt Blvd. back bar, front bar, 14 bar stools, cash register, 2 tables and 8 chairs. Back bar has 3 refrigerated coolers, separate cooler for beer storage. 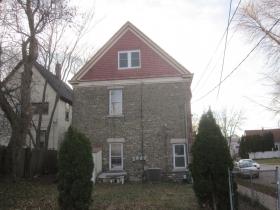 Rentals as follows: Tavern and lower living quarters at $195./mo. Tavern lease to expire July 1, 1974. Upper front $85/mo, upper rear $65. At the time, the gold mine was operated by Gary Hildebrandt, who operated it as “Gary’s Suds Pub,” which everybody called “Suds.” The building was owned in 1977 by Tom Ryan, who bought the place for $35,000 and ran “Big M’s. Tavern” there. In 1979, Ryan sold the place for $53,000 to Anna and Uldis Grosgalvis, who rented out the tavern for $495 a month. In 1980, a neon sign proclaimed the place to be “My Office.” That sign soon went dim, as did the “J&L Bar” sign that followed it that year. Finally, the place enters the modern era as The Gordon Park Pub, which was operated by Steve Johnson. Johnson retained the essential character of the building, which had been somewhat eroded by that time, but he did add some innovations, covering the grit and grime on the walls with original artwork showing scenes of the Riverwest neighborhood. 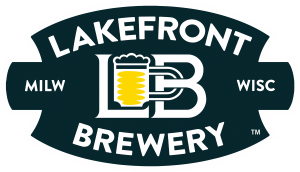 It was only natural that the guys from Lakefront Brewery would choose this place for the debut of their beer, particularly since Johnson seemed amenable to selling it. It’s still on tap and has been since 1987. Johnson shortly thereafter left to operate the Uptowner, where he remains in business just a block away, with a gallery full of neighborhood art and kegs full of Riverwest Stein. After Johnson’s departure, the tavern here was known as the Stork Club during the 1990s. It got grittier and grimier. The idea that it would open as a classy restaurant was hard to fathom for some. In 2002 the old building was purchased by the current owner, Mary Howard, and her husband Dean Cannestra, who commenced a considerable refurbishment of the old structure, revealing once again that an old Milwaukee “store and flat” building can be commandingly beautiful once all the junk is stripped off, especially the grit and grime, and especially when the wood below is beautiful patinated oak. 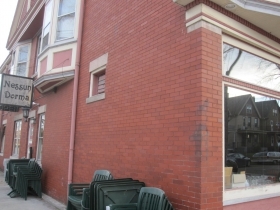 These buildings, as they say, have “good bones,” and this one has a particularly fine frame. The back bar appears to date to the end of Prohibition, and it is festooned with brightly shining spirits and cordials unknown to the drinkers back in the “Dan & Flo’s Family Tap” days when wine, if served at all, came from New York or California, not New Zealand or Catalonia. The walls are painted in a deep red color, purple in one room, and the asphalt floor, now long gone, has yielded to the close-grain maple original. It is burnished to a fine glow from the feet of many customers and the occasional accidental spilled droplet of Extra Virgin Olive Oil. Subtle details have been well tended to. A hutch such as found in hundreds of Riverwest homes of the era has been constructed, and the only hint that an opening in the room is a new one is a slight change of height, and the wider, looser grain of modern oak. This took time and money to accomplish. The renovations were thorough, and included the elimination of the old apartment in the rear, which is now the kitchen and supplemental seating space with purple walls. 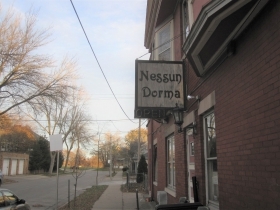 Although Nessun Dorma is categorized as a “restaurant,” it is still instantly identifiable as a bar, and you can enjoy it as such if you aren’t bothered by the specter of pleasant people dining quietly and politely in the same room where you drink. It is worth noting that the place still derives 60 per cent of its revenues from alcohol sales, which keeps it firmly in the tavern camp and that Riverwest Stein Beer is still on tap, along with a whole slew of other malt beverages unimagined when Josie Czaplewski built her store and flats in 1909. Make sure to take a look at the bar surface, which appears to be a single plank of mahogany some two feet wide, and over ten times as long — a substantial chunk of wood. This is a quality touch for the place, since many wooden tavern tops were composed of glued pieces that were subject to cracking and other problems. It may be worthwhile to photograph, or trace the woodgrain pattern on the bar top, and compare it with two others that are remarkably similar. The first is in the neighborhood at Veggas Pub, built in 1905 at 2479 N. Fratney St., and the second is at Sobelman’s in Mequon. That bar top was installed at what was then the Old Car Bar in the late 1960s. The top, as I understand it, had been removed from the Bohemian Hall, an 1895 building at N. 12th St. and W. Reservoir Ave. that burned in 1967. Location: 2778 N. Weil St., Milwaukee. Bike Racks: Yes. A rack is located along the north wall of the building where the prep cook can keep a good eye on it for you. Thanks for the fascinating history of this building. I’ve only known the building as Nessun Dorma, so learning more about it was interesting. It is definitely worth a visit to check out the bar surface you mentioned, plus the food is excellent and the atmosphere relaxing. Michael, I always look forward to these articles. You’ve introduced me to some spots I wasn’t aware of but are now favorites. I appreciate the research you do to bring out the unique features of each “Bar Exam” location. Thanks for the kind comments. Visit Nessun Dorma on Saturday to learn more. Come celebrate Lakefront Brewery where it all started, Nessun Dorma in Riverwest. On this spot 30 years ago, the first Lakefront beer was poured! Celebrate with Jim Klisch and the gang from Lakefront. Cheers! I didn’t know that the history of this bar goes back to 1909! And a “soft drink parlor,” is that what they were called? Good work, as always, Michael Horne! 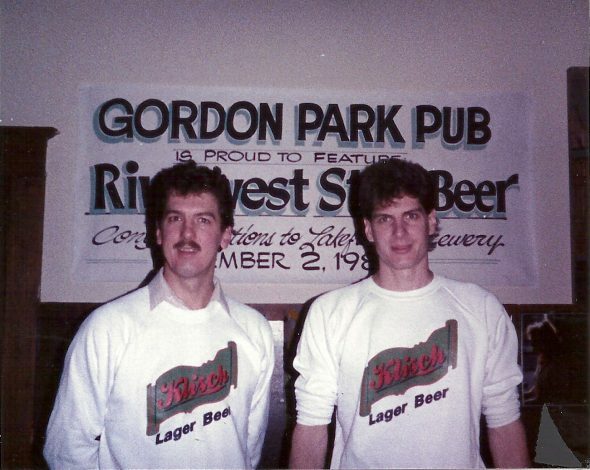 I was a proud employee of lakefront – Russ and Jim were my bosses. It was cooler than Antartica to make beer in that volume. Thank you both for keeping the homebrew fire in my soul alive. Way back then it was Lakefront and Sprecher..